The farm is one of the smallest mink farms in the country. A farm of its size (as shown in the photo below) is typical of a farm that can hold somewhere in the range of 2,000 animals, making it likely that every animal was freed. This is the 6th major US action of the summer, which has seen a horse slaughterhouse arson, two releases of birds from game farms, and three releases of animals from fur farms. 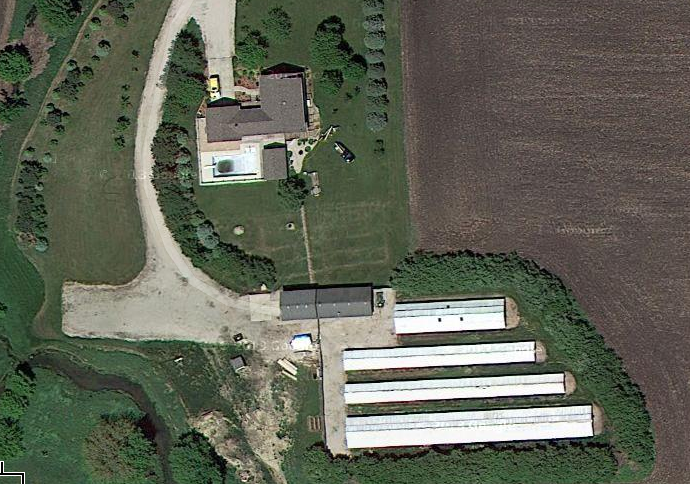 All three fur farm raids have taken place in less than one month. In late-July, as many as 4,800 mink were released from a fur farm in Burley, Idaho. And earlier in August, the last bobcat imprisoned at a Montana fur farm was released from its cage. This small wave of ALF fur farm activity comes after the slowest period since the Animal Liberation Front began its fur farm campaign in the mid-1990s. Last year, there was only a single release of animals from a fur farm: The release of 13 foxes from a farm in Elkton, Virginia. News of this action comes almost two weeks late, and it was not known of publicly until a Morris, IL newspaper ran the story today. No communique has (yet) been received, and there are no known details beyond what is reported in the article. The fur industry has (so far) remained quiet about the incident.